The Wisconsin Supreme Court election between Justice David Prosser and Assistant Attorney General JoAnn Kloppenburg has received more media attention than any state judicial election in recent memory. The race was extremely close, but following the tide-turning discovery of 14,000 unrecorded votes from Waukesha County, a Prosser victory now appears all but certain. A challenge from Kloppenburg’s campaign will likely lead to a recount of Waukesha County, along with the possibility of a federal investigation, so the official outcome may take some time. 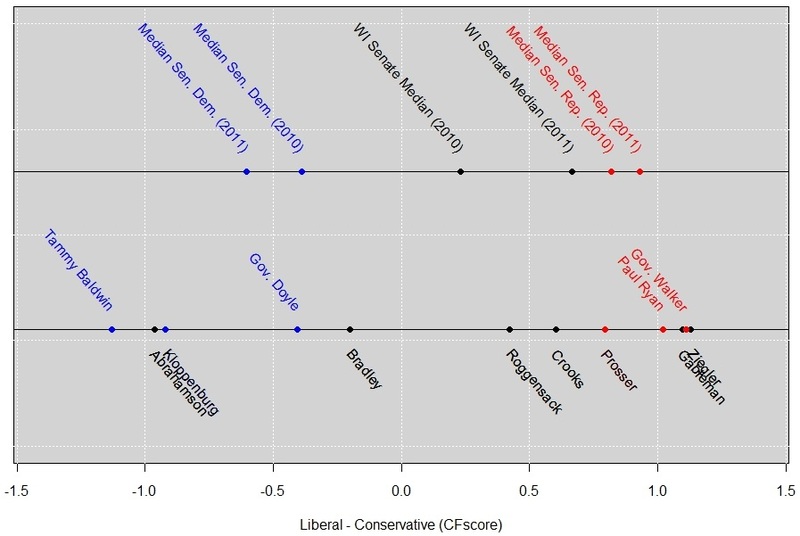 My co-author Michael Woodruff and I have been working on a paper that develops a quantitative measure of state supreme court ideology based on campaign finance records. I have come across several articles claiming a Kloppenburg victory would swing the court to the left. This naturally piqued my interest as something our measures can easily address. Below are the ideological measures (CFscores) for the current Wisconsin justices, as well as for Kloppenburg and a few other Wisconsin politicians. I measure Kloppenburg’s ideology based on 32 campaign contributions made by her over the last two decades. This sidesteps the problem of measuring Kloppenburg’s ideology based on a campaign that has arguably become less about her as a candidate than about opposition to Governor Walker’s policies. Kloppenburg is indeed far more liberal than Prosser, locating near Chief Justice Shirley Abrahamson. In this sense, a Kloppenburg victory would move the court to the left. However, what really matters is the resulting position of the pivotal (median) justice. If Kloppenburg wins, Justice Roggensack will become the median justice. Judging by her donors, Roggensack is a moderate conservative, not a liberal. I should note that the uncertainty bound on Roggensack’s estimate is unusually large, indicating that her donors are not an ideologically cohesive group. In other words, she belongs to the rare breed of candidates capable of raising funds from both liberals and conservatives. That being said, she raises the bulk of her funds from conservatives. Overall, 65 percent of Roggensack’s donors are conservatives (defined as individuals with CFscores >0.5), compared with 85 percent of Prosser’s donors, 24 percent of Justice Bradley’s donors, and a mere one percent of Abrahamson’s donors. I will refrain from speculating on Roggensack’s personal views on the union legislation or the extent to which it might influence her ruling on the matter. Yet I doubt she is eager for the union legislation to make it to the Wisconsin Supreme Court. If it does, siding with her liberal colleagues would risk gravely upsetting the majority of her donors. Unfortunately, siding with her conservative colleagues would similarly upset her liberal donors. Such is the dilemma of maintaining an ideologically diverse donor base. Whatever the outcome, the election is an important development for the court and Wisconsin politics in general, as there is good reason to view the results as a proxy referendum on Governor Walker’s policies. But regardless of which side prevails, the evidence suggests that the Wisconsin Supreme Court is destined to remain in conservative hands.